The Apple Watch is to the iPhone what the iPad was (and still is) to the Mac. When the iPad first debuted in 2010, Apple portrayed it as the future of computing -- an accessible, dynamic device that could offer a better experience than both a laptop and a smartphone. But getting to that idealistic future takes time. That's why, for years, the iPad still needed to be tethered to a computer for initial setup and subsequent backups. There were technical reasons for this setup process, but it was also a deliberate decision by Apple to not-so-subtly say that, despite the hype and marketing, the iPad was not quite a replacement for the Mac -- yet. Of course, that quickly changed. Both the iPhone and iPad eventually got their own built-in setup processes, as well as automated nightly backups to iCloud. iOS -- and with it, the iPad -- matured to a point where the Mac (or a PC) was no longer necessary for some. The iPad grew up. Since the Apple Watch debuted in 2015, it, too, has been a tethered device, dependent on a nearby iPhone for almost all use cases. With each iteration, Apple has increased the independence of the Apple Watch. Last year's Series 2 model added GPS and waterproofing, allowing for exercise tracking outdoors and in the water without the need for an iPhone to be nearby. Of course, in those situations, the Apple Watch became essentially a passive device. Without an iPhone nearby (and assuming you were not connected to Wi-Fi), you couldn't receive text messages and alerts, or talk to Siri. Apple Watch Series 3 with cellular changes that, and makes a standalone Apple Watch far more active. With its own built-in LTE radio, the Series 3 lets you not only receive messages, but respond to them, either by scribbling or using your voice. That alone is a huge improvement, but starting next month, it will also offer streaming music, offering outdoor runners and cyclists access to their entire music library right from their wrist. When you pair the Apple Watch Series 3 with a pair of Bluetooth headlines, particularly Apple's AirPods, the experience is even better. There is still a long way to go. You can't leave your iPhone behind all day. While the Apple Watch Series 3 boasts about 18 hours of battery life, that only accounts for about an hour of LTE use. If you stream music and use GPS without your phone nearby, you'll get closer to 4 hours of uptime. It is for this reason that the Apple Watch Series 3, despite the inclusion of a cellular radio, is still dependent on an iPhone. You can't set up an Apple Watch without an iPhone. You can't back it up without one, either. And you certainly can't pair or sync it to other devices, like an iPad, an iPod touch, or a Mac. Like the iPad before it, the Apple Watch is a subset of another platform. For now. For our review, we tested the Apple Watch Series 3 with cellular in both aluminum ($429 for 42-millimeter size) and stainless steel ($749) varieties. Internally, the devices are the same, including an S3 dual-core processor, W2 wireless chip, 16 gigabytes of local storage, and new altimeter for tracking floors climbed. It should be noted that the Apple Watch Series 3 without cellular has the same components, except for storage -- the non-LTE model only has half as much space, topping out at 8 gigabytes. It starts at $329 for the 38-millimeter size. In terms of specs, all you really need to know is that the Apple Watch Series 3 is noticeably faster than the Series 2, which itself was already a significant improvement from the first-generation hardware. Apps load faster, Siri responds more quickly, and the whole experience is improved. Externally, it looks the same. Sporting the same design means that legacy Apple Watch bands will fit the new model just fine. If you've amassed a collection of bands over the last few years as I have, this is welcome news. Aside from a shinier, more polished finish, the stainless steel model also boasts a sapphire crystal cover that offers greater scratch resistance. The aluminum model is protected by Ion-X glass. While the LTE models feature a ceramic back, the non-cellular versions have a composite back, all with heart rate sensors. And yes, all Series 3 watches with cellular -- including the ceramic Edition model -- feature a prominent red dot on the side of the Digital Crown. To us, this is a strange and unnecessary inclusion that makes the hardware less attractive. It's a rare design misstep for Apple, but far from a dealbreaker. One of the most common digs against the iPad -- and tablets in general -- is that if you want to get any "real work" done, you still need to get a Mac (or PC). While there is some truth to that sentiment, it is narrow minded and short sighted. Some tasks are better suited for a physical keyboard and a robust operating system with complex multitasking, but other computing needs are not only manageable, but in some cases are actually preferable on an iPad. Think about how many point-of-sale iPad terminals you see on a regular basis, and then consider how many Mac-based ones you have seen. Try drawing on your Mac. Try using a 15-inch MacBook Pro on an airplane tray table. As iOS has improved over the years, so too has the experience for getting "real work" done on the iPad, most notably with this month's launch of iOS 11, featuring the new app dock, Files app, and more. Suddenly, the prospect of getting "real work" done on an iPad isn't such a joke. Here again, there are many parallels with the Apple Watch. In some ways, the watch is vastly inferior to its parent platform, the iPhone. For example, you wouldn't want to watch YouTube on your wrist. Perhaps the best example of both the strengths and weaknesses of the Apple Watch with cellular is texting. Thanks to the addition of an LTE radio, you can now send and receive texts from your wrist while on the go. Leave your phone at home and remain connected. I have been texting on an iPhone since 2007. When Siri came along with the iPhone 4s, voice dictation never really caught on with me. It always seemed easier, more accurate, and less annoying to simply type. Old habits die hard. On the Apple Watch, you can scribble out notes on the tiny display to respond to a text, and it works pretty well, considering the size of the screen. But if you want to say more than a couple of words, using Siri is a vastly superior experience. Between the handwriting recognition, Siri, and customizable quick response prompts, the Apple Watch gets the job done when it comes to texting. Is it as reliable of an experience as typing on an iPhone? No. But in many cases, it might be far more convenient. Just like an iPad is better than a Mac in some -- but not all -- situations. Because it is always on my wrist, I use Siri far more on my watch than I ever have on my iPhone. I use Siri to send texts, to control HomeKit devices, to set timers, to check the start time on a football game. I've been doing this at home for the last few years. Now, with a cellular-connected Apple Watch, I can do it all on the go. Since the Apple Watch Series 2 launched last year, I have made a habit of running outside without my phone. With GPS and built-in storage, I could track my runs and listen to my music without having my phone nearby. Still, the experience was far from perfect. For one, the watch was limited to a paltry 2 gigabytes of synced music. And then there's the general "I don't have my phone on me" anxiety. Plus, what if something happens to me while out on a run and I need help? Or what if someone needs to contact me for an emergency? To be clear, LTE connectivity is not just advantageous for athletes. Anyone who wants to leave their phone at home for a few hours while remaining connected now has that ability, whether it's a woman who doesn't feel like lugging a purse to the movie theater, or a beachgoer who doesn't want to take their iPhone onto the sand. And as Apple Pay support at retailers expands, the Apple Watch will only grow in stature, serving not only as a replacement for an iPhone in certain situations, but also negating the need for a wallet. So to put the Apple Watch through its paces, I spent a Saturday in the park with it, sans iPhone. I ran three miles while listening to music on my AirPods (no streaming yet, but we'll follow up when Apple debuts that feature). I made a few phone calls -- one via my AirPods, and one on the watch itself (the call recipient said the difference in quality was negligible, and both sounded great). I dictated some texts and scribbled others. I asked Siri for the scores on a few college football games. I got breaking news alerts from The New York Times and The Wall Street Journal. After an hour and a half of pretty regular use, I returned home and was reacquainted with my iPhone. For the most part, I didn't miss it. None of these tasks was accomplished with as much power or luxury as would be offered on an iPhone display. And yet in many ways it was more convenient, more freeing, and simply more fun. It's not as easy to text on an Apple Watch as it is on an iPhone, but in that situation on a nice, sunny day, I found the experience to actually be more enjoyable. I dictated a response, lowered my wrist, and went back to enjoying the world around me. Siri talks now, too, so I don't even have to stare at the screen for a response. The Apple Watch is always on me, but never in my way. If there was one obvious thing I missed in leaving my phone behind, it was the absence of a camera. While out on my run, I saw something I wanted to capture to share with friends. Without my phone, that wasn't possible. This is not to say that I necessarily want a camera on the Apple Watch. Adding one could be cumbersome, unattractive, and potentially creepy. But if the Apple Watch is going to evolve into a truly independent platform, a camera feels like an inevitability. After an hour and a half in the park with heavy Apple Watch use, I had reduced the battery to 75 percent. Some will find this short battery life unacceptable. Those who do are missing the point. The Apple Watch is not an iPhone replacement (yet). Since I was going out that night, I left my watch charging while I took a shower. By the time I was finished getting ready, the battery was back at 100 percent. I wanted my camera that night, though, so my iPhone SE came with me. That's really where the Apple Watch is at in 2017. You'll still want your phone some of the time -- probably most of the time. But you don't need it, and that feels pretty good. What doesn't feel pretty good, however, is the pricing. Apple did a commendable job of getting an LTE radio into the Apple Watch at a reasonable price. The Apple Watch Series 3 with cellular costs only $30 more than the Series 2 did at launch. That's much more reasonable than the $130 up-charge Apple sells for an iPad with cellular. The carriers were not so generous. All four major cellular providers in the U.S. charge $10 per month for Apple Watch connectivity. And at that price, it taps into your regular data pool rather than expanding the data cap. Some carriers have softened the blow by offering the first three months for free. And the Apple Watch Series 3 is contract-free, so you can cancel your data plan at any time (or just not enact one at all). Still, given the limited capabilities of the Apple Watch, especially with the short battery life on LTE, carriers should not be charging users $10 per month for connectivity. A rate of $5 per month seems more reasonable. Along with the Apple Watch Series 3, Apple released a new "Sport Loop" band. This is a lighter, more breathable alternative to the rubbery fluoroelastomer Sport Band. The new band loops around the bottom of the watch face when worn on the left wrist. Underneath, it has five velcro-like surfaces that adhere to the band. In terms of aesthetics, it's a pretty ho-hum band. It is, however, very comfortable. It should be noted that the band works fine in water and is unlikely to degrade in the way that, say, a leather band might. In fact, showering with the band might be advisable after a workout, given that we found the material absorbs some sweat and odor. The other big change for this year is watchOS 4, which runs on all Apple Watch hardware, including the first-generation model. watchOS 4 is a welcome improvement, but does not represent the major shakeups that occurred with watchOS 2 and watchOS 3. Most notably, however, the app home screen can now be viewed as an alphabetical list rather than the honeycomb layout. The dock has also been redesigned to roll through apps like a ferris wheel. The apps rotate in the same vertical direction as the Digital Crown. The new dock has the advantage of being able to show up to three apps at once as they are scrolled through. However, the 3D scrolling also obscures the bottom portion of apps so the entire app screen can not be viewed (as was possible with the previous dock). Frankly, we prefer the old dock and seeing the full app. The Music app has also been redesigned, and is generally a much better experience, save for one huge error on Apple's part: You can no longer browse an iPhone music library from your wrist -- interaction with the iPhone's music is limited to controls only after playback is started on the phone itself. Despite that change for the worse, Apple did make one change that vastly improves interacting with iPhone content -- a "Now Playing" screen automatically displays on the watch when content is played from an iPhone. This makes it infinitely easier to adjust volume, skip tracks or pause music from your wrist. You'll just have to start that playback on the iPhone first if you want to take advantage of this. We hope that Apple will fix the issue and reinstate the ability to browse an iPhone's music library in a software update. The Apple Watch Music app now only allows you to browse music stored on the device. The limits on local music storage remain something of a mystery -- I managed to sync more than 4 gigabytes of music with one playlist and the "Heavy Rotation" feature. But when I attempted to add another playlist, the iPhone Watch app told me I could not transfer anymore, despite the fact that I had a whopping 9 gigabytes of storage available. All of this will be a moot point once Apple Music and iTunes Match streaming come to the watch next month. That won't be the case for every user, though. As watchOS improves, Apple needs to give users more control of their music library. I solicited reader questions on Twitter in advance of publishing this review, and most reader concerns seemed to revolve around two issues: battery life and LTE connectivity. Regarding battery life, results vary wildly depending on how -- and how frequently -- you use the watch. As we mentioned, using LTE on the go with Bluetooth audio and GPS and heart rate monitoring is a recipe for draining your watch in half a day, easily. If you're a light user who has your phone on you most of the time, you'll have no problem getting through a full day. Most readers who had been testing their watch for a few days expressed the same sentiment: Battery life on the Apple Watch Series 3 with cellular is just as good if not better than previous models. But if you push the device to its limits, you'll need to recharge. In short, expect to recharge nightly for average use. As for LTE, many of the concerns involved misconceptions regarding the Wi-Fi bug that was previously publicized. If you're unfamiliar (or confused), the Apple Watch Series 3 with cellular can have zero connectivity if the watch is within range of a known public Wi-Fi network. In short, if you use your iPhone to connect to your city's free Wi-Fi, or internet at Starbucks or McDonald's, or any restaurant or cafe, it may cause problems. That's because many public Wi-Fi access points require users to agree to terms in a browser before logging in. The iPhone automatically shares known Wi-Fi networks with the Apple Watch to keep the experience simple and easy. But the watch cannot bypass public Wi-Fi login screens. And because LTE use is such a battery drain, the watch prefers known Wi-Fi networks over cellular. I didn't experience any of these problems in my tests. But to ensure I wouldn't have issues, I also conducted a purge of bad Wi-Fi info before setting up the Series 3. The bug is an unfortunate oversight by Apple, and one that the company has vowed to fix. We suspect the patch will arrive soon, and this problem will be a moot point. With the Wi-Fi bug out of the way, we saw no problems with AT&T's LTE connectivity in New York City. It would seem to us that if you have two or more bars of signal on your iPhone, your watch will perform just fine on cellular. That could change when more data-intensive tasks like music streaming arrive. But for now, your notifications and texts won't be an issue. Where does Apple Watch go from here? Seven and a half years into its lifespan, the iPad is still finding its footing as a standalone computing platform. Expect the Apple Watch to follow that same trajectory. iPhone independence may be inevitable, but technical challenges remain. It's unlikely that Apple would rush to deliver a completely iPhone-free experience with battery levels at their current state. The Apple Watch's dependence on the iPhone is necessary not only from a technical perspective, but it also communicates very clearly to the user that the watch is not an iPhone replacement. It's a supplement. The watch's separation from the iPhone will be gradual, and the Series 3 is the latest step in that ongoing evolution. And it's a significant step. Aside from the aforementioned camera and necessary battery life improvements, the Apple Watch could also stand to have some sort of always-on, low-power display mode. It would also be nice to see the Apple Watch become more connected and platform agnostic. GymKit is a step in the right direction (if your gym has new treadmills, at least), allowing the Apple Watch to talk to something other than your iPhone. Why can't my Apple Watch talk to my iPad? Or my Mac, beyond logging in and Apple Pay in Safari? Why aren't there Apple Health and Activity apps for iPad and macOS? And why can't an Apple Watch talk to (gasp) Android devices? The latter question notwithstanding, the other options seem logical. Concepts like "smart bands" have been rumored for years, but seem less certain. Having a modular platform with bulky, optional accessories doesn't seem like the approach Apple would prefer, but perhaps they'll open up the ability for third-party manufacturers at some point. Such gimmicks, however, may prove unnecessary. Two and a half years into the Apple Watch's life, Apple has pinpointed the sweet spot where its wrist-worn computer functions best -- light communications and fitness tracking capabilities that are available when you want them, and get out of your way otherwise. It's a new way of being connected while also being in the moment. The groundwork has been laid, and Apple Watch Series 3 shows us that the underlying technology of the watch is starting to catch up to the concept of the platform introduced two and a half years ago. It's fun to think about the future of wearable devices from a geeking-out perspective, but wondering whether or not you should wait for hypothetical advances to the hardware in 2018 and beyond would be a mistake. Apple's iPad came out of the gate at a blockbuster pace, selling millions and growing at a rate that made some wonder if it could be bigger than the iPhone. It isn't, though, and sales cooled. Why? The most popular theory is that those early iPads bought by consumers proved to be "good enough." That is, unlike an iPhone that customers want to upgrade every year or two, the iPad has a longer shelf life of four or five years. In many ways, the longevity of an iPad is a testament to Apple getting it right on the first few tries. The iPad did what it set out to do, and it proved tough to improve on a winning concept -- and even tougher to sell consumers on incremental hardware improvements. If you're new to the Apple Watch, you may be wondering if the device is at that "good enough" point where you can jump on board and be happy with your $400-plus investment for three, four or even five years. I think the answer to that is yes. If you already own an Apple Watch, the decision on whether or not to upgrade is less clear. Many users see absolutely no need for an LTE radio, as they always have their iPhone on them no matter what, and have no intention of leaving it at home. Others may be turned off by the $10-per-month data plans. If you have a Series 2 watch and don't care about LTE, the speed improvements alone are not worth the investment. The Series 2 is good enough. First-generation watch buyers will have an easier time buying into the upgrade. And for those with the first watch who don't care about LTE, the Series 1 model with dual-core chip is a great (and affordable) option to consider -- provided you don't care about GPS or swim tracking. The dirty little secret of the Apple Watch since the first hardware launched was that the apps themselves were, to put it bluntly, almost worthless. Apple tried to suggest the Apple Watch could be the second coming of the iOS App Store, but that was a big misstep on the company's part -- at least back in 2015. Until now, the Apple Watch has worked best when used passively, for a number of reasons. The screen is too small, the hardware has been too slow, and you've always had a bigger, more capable and more powerful device on you, in your pocket. Why would you spend your time texting from your watch when you can just pull out your iPhone? Getting notifications on your wrist and tracking fitness were the strengths of the platform, and features like Apple Pay and Siri were icing on the cake, making it a worthwhile investment. But third-party apps weren't just an afterthought -- in many cases they were a complete joke. Bringing LTE into the mix changes things. I'm not suggesting that some sort of Apple Watch app renaissance is on the horizon, but I suspect that apps -- especially non-fitness ones -- will find some more utility and use in a brave, new, iPhone-free world. The iPad never replaced the Mac, and the Apple Watch will not replace the iPhone. But when each platform stands on its own legs, the ecosystem becomes even stronger. The addition of LTE has nudged the Apple Watch experience from passive to slightly more active, and that's a good thing. With Apple Watch Series 3 with cellular, the Apple Watch continues to find its footing. One day it'll leave the nest for good -- but for now, it's only allowed out of the house for a few hours at a time. Apple authorized reseller B&H Photo is currently taking pre-orders for the new Series 3 watches with free expedited shipping and no sales tax on orders shipped outside NY and NJ. According to B&H, orders are shipping as limited stock trickles in, so grab your place in line. Series 1 models are also available now with discounts of up to $20 off. Apple once again proving all the haters wrong. Where are all the clowns who said the Watch was a flop? All those haters are either ignorant, dumb, or lack vision. Well people ARE allowed to have their opinions but I must admit it always fun to see them with egg on their faces. Apple must be doing something right because the number of naysayers running around with their hair on fire is increasing. That they are frantically upping their game says they are losing badly. That is Carrot Weather, which quite frankly is the best third-party app available on watchOS. It lets you have a complication with both temp and conditions, which I love. It's a $4 app, and I think another $1.49 per year for regular (~30min, I think) refresh updates on the watch. It also does hyper-localized weather stuff, so I get alerts like "It's going to start raining at your location in 15 minutes." The app itself is great, as is the complication. If you don't want to spend the money, there are some free options I tried, like Weather Underground, which also offers a combined temp+conditions complication. And another paid alternative that's pretty popular is Dark Sky. Well it is still fat & ugly... and still can’t make phone calls. The Watch will remain a niche product. Strapping an IPhone to your arm seems more practical, unless you have money to burn. IOS11 is great (by the way) navigation works well, it’s noticeably faster, and I think battery life has improved. I want my AW to record my running or biking activities and then upload it to Strava. I think there was a rumor about this for IOS11? You're wrong. As I said in the review multiple times, it makes phone calls. Does the ceramic version authorize better wifi/BT and LTE reception ? Look into an app called RunGap. It's not ideal, but it allows you to transport data to and from various fitness services from your iPhone. I used to use it to import runs saved in Apple Health to RunKeeper (I believe at the time RunKeeper let you *export* runs to Health, but not import them — that may have changed in the years since). I eventually got fed up with the situation and gave up on RunKeeper, and just switched to Nike+ Run Club, which supports Apple Health in a more fully featured way. I've never used Strava, but I do see it's supported in at least some capacity by RunGap, so that may solve your problems. But I don't believe the Apple Watch will ever be the purely standalone product the author sees in its future. First of all, the use cases for such a product are just too few. The addition of cellular is a benefit that only athletes with cash to spare (for the extra 'line') and who insist on having their entire music collection available during a workout and who must be on-call at all times - that's a pretty small market. The vast majority who buy an Apple Watch are happy with its notifications and workout tracking and, maybe, listening to a few favorite tunes while working out. We don't need (or even want) notifications or calls while exercising. So the lack of a nearby iPhone during those times does not even register as a negative - besides, most of us are overweight people whose idea of workouts is a swift walk - in which case the phone is with us anyway. And there's the fact that most of us don't want to spend $10 *every month* for a capability we'll rarely use - and for which we're already paying with our iPhones. I think Apple should have tried harder to make its watch's cellular and its parent iPhone's appear as one to the cellular companies - certainly, with today's "software SIMS" it seems feasible that cellular could have beeen 'handed off' between the two devices - i.e. if you're going out for a run, Apple Watch's cellular comes on and the iPhones' turns off - thus avoiding separate data charges from the telecoms. The analogy to the iPad isn't realistic. The iPad always had huge appeal as a standalone web browsing/reading/gaming device - it was always a device you actively interacted with. The fact that initially it still needed to be tethered for initial setup or backups was really just a minor annoyance. The watch, with its much more limited interaction potential (there's only so much time someone who has a life wants to spend tapping that tiny screen) will never be the center of someone's attention the way the iPhone or iPads have been since their inception. And that's not a bad thing! In a couple years, the iPhone will rarely come out of our pockets as we don our new Apple AR glasses, have AirPods in our ears, and have more and more of our vitals measured by our Apple Watch. The phone will remain the central controller/storage for these wearables. An informative, and well written article. Thanks. There shouldn't be a difference. The LTE antenna is actually the display itself, which is not obscured by the casing. If there are any differences, we haven't noticed them — and short of having an advanced radio signal testing chamber, no one else is going to see a difference either. Adding LTE to the watch was, I believe, a huge improvement. But, it must also be realized that this does not actually add any functionality to the watch. It just makes it a (far) better stand-alone device. For myself: I wear a Gen 0 throughout my waking hours and use it daily for running, cycling and strength training. While I would love to have a Series 3 (brighter screen, faster processor and more independence from the iPhone), I am still waiting for some actual functional improvements in the Watch before upgrading. ... Right now, there's nothing I could do on a Series 3 LTE that I can't already do on my 1 year old Gen 0. 2) Better software. Apple's exercise tracking software is pretty basic stuff and cannot compete with 'the pros' like Garmin. It isn't even in the ball park. And, Apple made almost no attempt to improve it with Watch OS4 -- just a few token changes. Third party apps might be the answer. But, so far, they mostly run on the phone and interface with the watch -- which makes them slow and clunky no matter the speed of watch's CPU. I totally believe that the Apple Watch has a bright future ahead of it. But, while the Series 3 LTE was a giant step, the Apple Watch still has further to go till it begins to realize its true potential (at least from a sports and health perspective). And, why is Apple getting its exercise information from Nike? Nike has become a mainstream clothing manufacturer for (mostly) lower level amateurs. Apple should be talking to more serious athletes -- not necessarily pros, but serious athletes. Technically and hardware wise the Apple Watch is very, very close. What it lacks is great software. Let him go. He’s just trying to use the LTE/WiFi issue as a stick to poke the anthill. Not very effective but hey, he’s trying. I know there was a lot of chatter about a glucose sensor being built into this year's watch that never came to be. I never bought into those rumors, and frankly I wouldn't hold your breath for these kinds of sensors coming to the watch in the near future, for a number of reasons. First and foremost, the more medical functionality that Apple builds into the device, the more likely it is that they will need to get FDA approval for various capabilities/claims/features. That's a regulatory can of worms Apple likely doesn't want to open. Second is utility. SpO2 and glucose sensors would be great, but most consumers don't really need that information, as it's not a health issue for them. About 9% of the US population has diabetes, but 100% of them have a heart rate. That's not to say that Apple wouldn't include these capabilities if it was easy/cost efficient, but given a number of factors including space constraints in the device, I am not sure it's a priority. Finally, advanced medical devices are going to be less reliable and less accurate when squeezed into a tiny wearable device and worn loosely on the wrist. The Apple Watch heart rate sensor is great, but it's not as reliable as a chest-strapped heart rate sensor — which is exactly why, since day one, Apple has given the ability to connect the watch to an external Bluetooth heart rate monitor and to defer heart rate readings to that device, and not the watch itself. I have no doubt that technology will continue to improve and medical devices will get smaller, but we're not really there yet. Coming back to those glucose monitor rumors about the Series 3? The ones that included Tim Cook personally testing it? It turned out that they were related to an external accessory that taps into the new Core Bluetooth capabilities announced at WWDC. And the continuous glucose monitor doesn't operate on your skin — it has to be *embedded within your skin*. That, for better or worse, is the answer to your desires: Advanced sensors are probably going to be integrated in other ways, whether they are external Bluetooth accessories, or the hypothetical "smart bands" I touched upon in the review, or, I guess, stuff embedded in your skin. 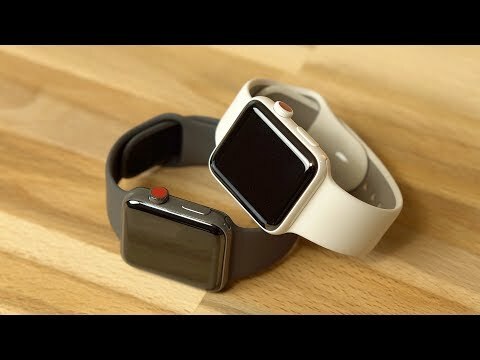 Making them separate accessories solves all of the problems I listed above — it avoids FDA regulation of the watch itself, it allows the features to target audiences that need them, and it enables more capable medical devices that don't have to be packed inside of a wearable device that is size of a few stacked silver dollars. A very good and thorough article. A couple of things occur to me. While watching the news of events in Puerto Rico, Mexico, the Caribbean, North Korea and with health care, I find it insane how people are so worked up over an effing red dot on a watch. Go do some volunteer work as your priorities are way off. If you really aren’t going to buy the watch (as some have pledged) because of that dot....well great since I would like not to be in the company of such ridiculous folks. Next, why is it necessary to photograph so many aspects of one’s life. Half or more of the posts on facebook I couldn’t care less about. Do I really care about your upteeth selfie or what you ate for breakfast? Finally, i keep seeing the $10/month cost cited...sprint, the scourge of the planet, is charging $15/month. Autobill would be out of the question if sprint screwed up your bill the way they did mine taking 3 billing cycles and literally hours on the phone with spri-nitwits to get rectified. Eight hours, a worthless trip to a sprint corporate store, and being lied to over and over again by sprint, I finally dug in with my own smarts and figured out how to get it done. MENSA is a good thing. my first gen Watch got a nice speed bump with last years software update, but not so with this update. Apple could/should solve my battery issues if they would provide a built in wireless charger to their iPhone battery case (which has really worked great for me). My Watch could then get a late day charge on the go, as I am rarely without my iPhone. LOL...athletes the only market? LMAO or you could just be rich and get it because you want it....such people exist. LOL. It will ne interesting to see if your prognostications come to pass....i am not betting on you because of flawed assumptions and a lack of vision..but thanks for the smile. I once spoke with an accessory manufacturer who made a device that tapped into the Lightning port on the iPhone. Notably, the accessory had its own battery that needed to be recharged (via micro USB, no less), despite the fact that it was plugging into a Lightning port that can provide power to accessories. I asked why that was the case. They explained to me that Apple is very strict about accessories drawing power from the Lightning port, especially on the iPhone. They know that consumers want more battery life out of their phone, and that it's pretty much the number one complaint about the iPhone. And so they basically won't allow any accessories that draw power from the port on an iPhone. The iPad is a little more lax, given its larger battery, longer uptime, and less "mission critical" use cases in most people's lives. That's why you see the Apple Pencil recharging from the Lightning port. So the phone itself will never recharge the watch, you can be sure of that. But building wireless charging into the battery case is an interesting idea. I like it. If Apple doesn't make this, hopefully a third-party manufacturer will. At the moment, the only portable Apple Watch charging method that I know of is a battery with integrated magnetic charger from Kanex, which I reviewed here. I'm hopeful that we see some pretty neat new, thin battery cases for the iPhone 8/X, thanks to inductive wireless charging. Especially ones that don't obscure the Lightning port, so you can get power on the go and use wired headphones at the same time. I am very disappointed with the battery life of this product. Especially adding LTE which uses a lot of battery. I was looking forward to the AW3 doing sleep tracking but I do not think it does. If it did, the 18 hour battery charge would not be adequate. Too bad.